Afin de permettre aux non-francophones de joindre le Riviera JUG nous voulons savoir si vous seriez d’accord pour faire les présentations en anglais. Faites-connaître votre avis sur notre forum. 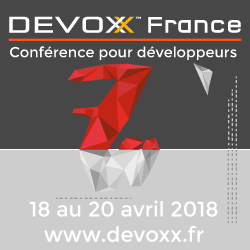 In order to allow non French-speaking people to join the Riviera JUG, we would like to know if you want us to make all presentations in English. Make your voice heard on our forum.